The festivities allow brands to come up with different concepts and showcase themselves in a different light to the consumers. Almost every brand expects to remain on top of peoples mind and this gives the consumers to witness a lot of creative juices flowing all out there. 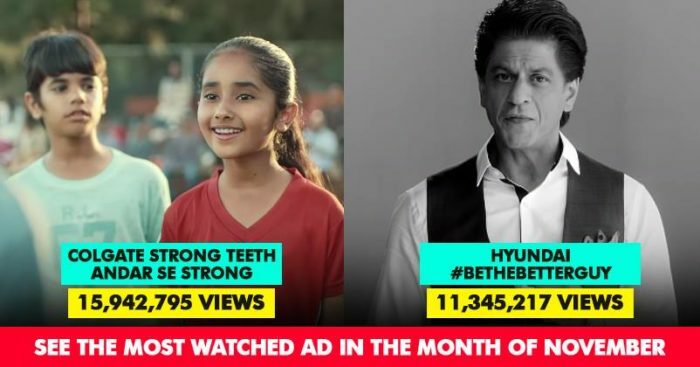 Here is the list of 10 most watched ads on YouTube in the month of November. Riding high on the success of Andhadhun and Badhai Ho, Ayushmann Khurana, and Samsung together write another success story with Samsung Galaxy A9 phone. Many people were eyeing the first quad-camera phone from Samsung and undoubtedly it made for the most watched ad on YouTube. The curiosity that surrounded the phone helped it garner so many views and get the number one spot for November. Hitting hard on the duplication and copy market, Bisleri emphasized on making the right choice while buying bottled water. Many people just end up purchasing bottled water in the name of Bisleri, but they do not realize that these fake brands do not provide safe and pure drinking water. This 30-second ad is definitely interesting and helped Bisleri secure a second position. Airtel has been on a spree to make the customer relations stronger and launched he #AirtelThanks campaign. Through this campaign Airtel aimed at extending exclusive benefits to its customers including premium content. Airtel postpaid users with monthly plans of Rs 499 and above get a 3-month free subscription of Netflix worth Rs 1500. As per Vani Venkatesh, CMO Airtel, the brand is focusing on making their customers feel special and guess this is what made the ad campaign generate 14 million views. Harping upon the need for people to hear what girls and women have to say and respect their inputs, Colgate launched its new campaign ‘Andar Se Strong’. The ad has garnered more than 13 million views making it the fourth most-watched ad in the month of November. Another ad from Samsung Galaxy A9, which focuses on the features of the quad camera phone, became very popular with the audience. The advertisement gathered more than 11 million views securing the fifth spot. Hyundai was a back with a bang, not just with relaunching Santro, but also with this ad. The road safety campaign – “Be The Better Guy” in association with the Ministry of Road Transport and Highways, aimed at creating a awareness amongst people to adhere to traffic rules saw Shah Rukh Khan promoting the message across. The ad clocked in more than 10 million views. Building on the importance of a healthier lifestyle, Sunfeast Farmlite came with a campaign to address both Children’s Day and World Diabetes Day. The ad showcases how children can inherent a healthy lifestyle from their parents and how it is good to focus on a healthy lifestyle right from the beginning. Continuing with the festive mood, Amazon showcased itself as a one-stop shop for all festive and household buying needs from large items like fridge, washing machines etc to basics like groceries and daily items. This ad raises awareness and concern towards the growing addiction to mobile phones and stresses on spending time with family and having real conversations. An emotionally high content got the ad around 8 million views. Flipkart brings attention to gender sensitivity and harps on accepting the changing society. The campaign ‘Naye India Ke Sath’ is all about breaking the stereotypes and accepting that how it is ok for men to cry or like the color pink openly. So which one is your favorite from all these top 10 ads?